The FFA Agriscience Fair recognizes middle and high school students who are studying the application of scientific principles and technologies in agricultural enterprises. Areas of participation closely mirror those of the International Science and Engineering Fair but reflect an agricultural theme. Categories include: Animal Systems (AS), Environmental Services/Natural Resource Systems (ENR), Food Products and Processing Systems (FPP), Plant Systems (PS), Power, Structural and Technical Systems (PST) and Social Science (SS). Participants in the Hall of Georgia Exhibit contest create a booth that showcases Georgia agriculture. Booths are judged and three finalists are determined. The winner will exhibit their booth at the National FFA Convention and Expo. The booth should, at minimum, be the same booth exhibited at the Georgia FFA Career Show. National FFA relies on the support of exceptional teachers, individuals and companies to provide life-changing experiences for its members. Nominations from Georgia for the Honorary American Degree are handled through the Georgia FFA Office. 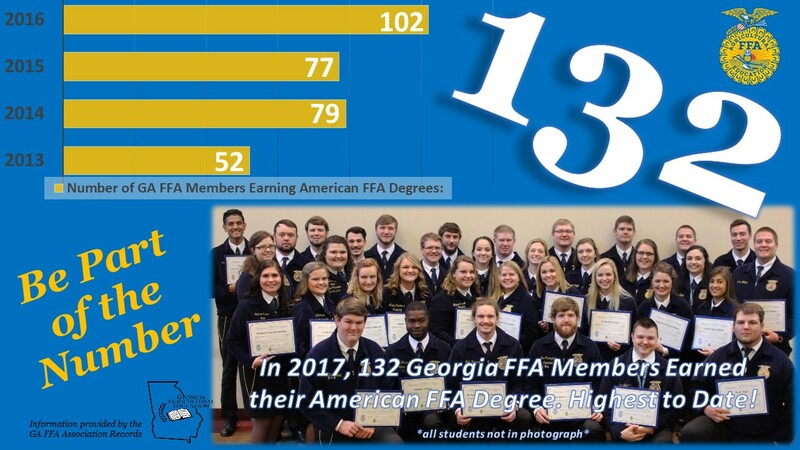 The Honorary State FFA Degree is the highest Honorary Degree offered on the state level, and it is presented annually by the Georgia FFA Association at the Georgia FFA Convention. The Middle School SAE Awards Program recognizes outstanding SAE programs for FFA members in grades 6, 7, and 8. The National Chapter Application and state Chapter Achievement Award recognize outstanding chapters. To be recognized as Superior, a chapter must complete Form I; to be recognized as Bronze, Silver or Gold on the state level and as three, two or one star on the national level a chapter must complete Form II. The National FFA Week Observance Award recognizes those chapters who have successfully and productively utilized FFA week in their Program of Activities. The Proficiency Award Program recognizes students for outstanding Supervised Agriculture Experience programs. The State Star award program is designed to recognize the most outstanding agriscience, placement, agribusiness and production based supervised agricultural experience (SAE) programs among all State FFA Degree recipients in a given year.